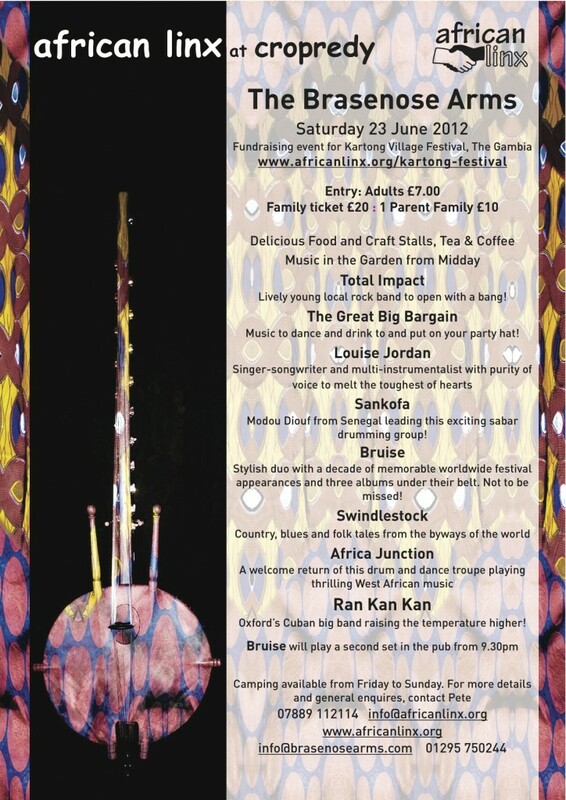 Come and Celebrate Mid-Summer at African Linx One Day Festival, Cropredy, Oxfordshire! Come and celebrate mid-Summer on Saturday June 23rd at The Brasenose Arms, Cropredy, OX17 1PW from midday till late for the annual African Linx Festival! We’ve got a great line-up of music including the marvellous Oxford 22-piece Cuban band, RanKanKan and the lovely Louise Jordan, as well as Africa Junction and Sankofa, Chandra Moon and Paddy Uglow and DJ Fare to name but a few! There’ll be wonderful stalls, cakes and food and more entertainment in the pub to finish off with from 9.30pm till late. For those that want to make a weekend of it, there’s camping only a few minutes away for vans or tents (let us know please if you’d like to camp). We’re aiming to raise at least £1,000 towards the Kartong Festival in the The Gambia, so please can you do your bit by coming if you can and telling as many of your friends and family all about it and encouraging them to come along too – it’s a very inexpensive day out! If you can’t make it along yourself on the day, would you consider making a donation (however small [or large ha ha]) made payable to African Linx (please email us to request the address for the cheque).